Less than two months from now, a number of us from Metropolitan Wargamers in Brooklyn, NY will be attending this year’s HMGS Fall In! convention the weekend of November 6-8, 2015 in Lancaster, PA. I, some fellow club members and my brother have a variety of games from different periods we’re presenting in several scales, and the events will be geared toward a variety of levels of gamer experience from beginner to veteran. Here’s a rundown of our scheduled games so far which you can find along with hundreds of other games listed online in the convention’s event list. Re-fight the Battle of Rivoli that crushed the first coalition and set Napoleon on a trajectory toward consulate and empire. Will 23,000 French repeat their historical victory over Alvinczi’s 28,000 Austrians? Or will Napoleon’s rise end in the fields of Piedmont? A follow-up to the truly spectacular award-winning Battle of Marengo on a custom-built terrain board from previous HMGS conventions which you can view here. 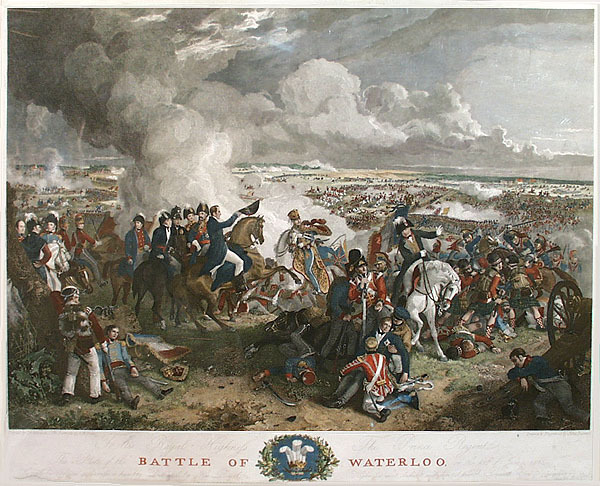 Play one of the greatest battles in history on the 200th anniversary — Waterloo. Napoleon’s French attack the Anglo-Dutch army led by the Duke of Wellington. Time tested home rules perfect for anyone new to Napoleonics or for experienced players. Fast play for convention yet with all the detail and pageantry of the era. This game is being run by my brother who presents games of the Napoleonic Wars in 6mm, 15mm and 28mm with gorgeous hand-crafted tables and his beautifully painted figures, so this one will also be a treat. It’s the summer of 1944. Famed German tank ace Ernst Barkmann is rolling through Normandy commanding his Panther and looking to halt the Allied advance. Amid the bocage of the French countryside, a US armored column encounters Barkmann in a showdown at a crossroads which will become legend. A great learning game for people new to FOW (including kids with adults). I’ve run this short scenario before (report and pics here) and it’s a blast to play if you like pushing tanks around the table. A British/Indian delegation during the American War of Independence has arrived in wheeling to discuss a prisoner exchange. Both commanders hope the exchange goes off everything might go off without a hitch, and everyone might go home happy. But this is a wargaming convention, so don’t count on it. Winning will require negotiation, flexibility, deceit, and the element of surprise. Each player has his her own victory conditions. A club member who is a college instructor with expertise on American Colonial warfare is running this game, so it’s sure to be laced with colorful historic narrative. Can the British home fleet stop the German breakthrough into the Atlantic? It’s the autumn of 1944. As part of Operation Market Garden, the US 502nd Parachute Infantry regiment has parachuted into Holland and seized an important bridge on the Dommel river at St. Oedenrode. Rushing to counter attack are German Fallschrimjager regiments supported by artillery and armor. Can the allies hold the bridge until reserves arrive or will the axis rush to retake the objective? A great learning game for people new to FOW (including kids with adults). This is another scenario I’ve run several times before (report and pics here), and I’m also working on some new models to bring along in time for the convention. Can the British Mediterranean fleet stop the Italian fleet? We’ll also be planning to run other games including two games based on the 1980s movie classics Mad Max and Red Dawn. You will be able to spot the members of Metropolitan Wargamers wearing our new club shirts celebrating over three decades of gaming in New York City. We’re certain to have a some other surprises at the convention, so sign up for Fall In! and we’ll see you in Lancaster in November.